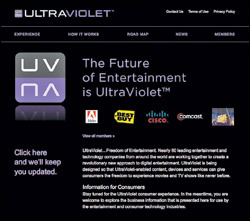 The Digital Entertainment Content Ecosystem, or DECE, is a consortium backed by a whopping 58 high-tech and content providing companies, including Warner Brothers, Paramount, NBC Universal, and Lionsgate on the content side, and Microsoft, Intel, HP, Samsung, Sony, and Panasonic on the tech side. Netflix and Comcast, as content deliverers, are on board and could prove vital. Sony is kind of the ringleader on this one, with Sony Pictures CTO Mitch Singer working as president of DECE. You might notice a couple of conspicuous absences on that list, most importantly Apple and Disney. Disney is working on its own version, called KeyChest, and Apple has declined to get involved at all, owing perhaps to its own iTunes ecosystem. DECE’s project, which has just been officially named UltraViolet, is a digital locker system. The idea is that a customer is given a sort of token, or proof of purchase, after buying a movie. That token will allow the customer to watch that movie on any variety of devices for no extra fee, ideally streamed over the Internet to mobile devices or set-top boxes hooked up to TVs. There are lots of hurdles to this kind of system. Getting all these companies to play nice is going to be a problem: It’s doubtful they’ll all agree on, for example, pricing. Also, there’s no consensus as to where the files will be hosted, and with which protocol they’ll be delivered. There’s no indication of who, exactly, will be making the devices and designing the apps. Would Apple agree to such an app? Would Google? So the service is clearly far from ready, but according to a press release that went out today, DECE promises that testing of UltraViolet will begin sometime this year. We’ll keep you updated on the progress of this project. Dan Nosowitz, the author of this post, can be followed on Twitter, corresponded with via email, and stalked in San Francisco (no link for that one–you’ll have to do the legwork yourself).